Streakers, current leader Joe Turner has answered the call — well, the email, actually. 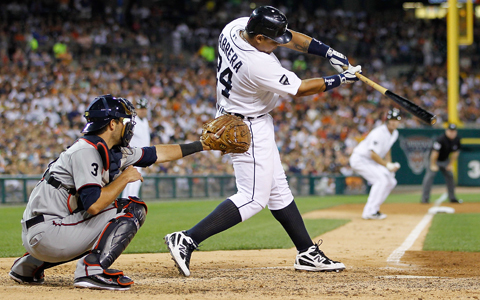 After reaching 37 games with Miguel Cabrera last night, Joe disregarded the (FAKE!) BTS Report Curse and agreed to answer a few questions about himself, his life and his favorite foods. First off, Joe works for a beverage company and lives with his wife, Jennifer, near St. Paul, MN. He once met Herb Brooks (yup, this interview took a serious turn toward the upper Midwest), roots for the Twins and misses the glory days of Kent Hrbek. Don’t we all, Joe. In Streaking news, Joe has been playing BTS for a couple years and claims to be a “big fan” of the Report. #yabuddy. Like season leader Jonathan Roy, he mostly picked random players until his streak reached 20 games. Uh oh, the commenters aren’t going to like that. Forget the previous sentence — Joe actually conducts daily six-hour ballpark wind pattern studies and purchased industrial-grade computer graphing software to help make his selections. I swear, that’s (definitely not) what he told me. Annnd since you’ve all been waiting for it: Joe’s favorite food is his wife’s taco pie. It’s unclear what taco pie consists of, but if it involves both tacos and pie, it cannot be un-delicious. Good luck to Joe the rest of the way. Feel free to offer your congratulations, Mall of America stories and taco pie recipes in the comments. sandoval and pence each send 2 back to zero.